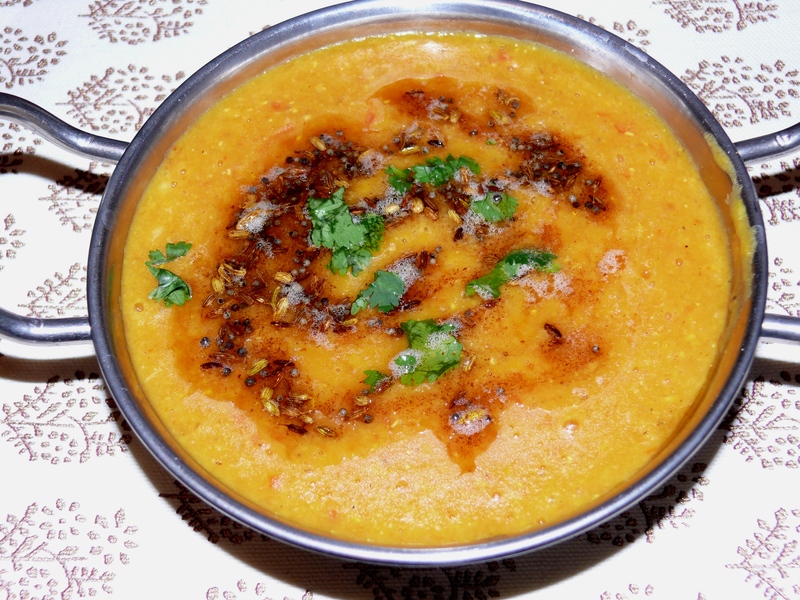 I found an interesting new way to make dal on No Recipes by charring the ginger and garlic first! Kind of like how the onions and ginger are charred in Pho (Vientamese rice noodle soup). This masoor dal with charred ginger and garlic comes together very fast and is simple, yet it is so flavorful. The charring of the ginger and garlic gives it a little something something. It isn’t an authentic Indian technique, but it sure works. Masoor dal can be found in an Indian market. You could also use yellow mung dal (cook about the same amount of time) or toor dal (pressure cook for about 8 minutes after the first whistle). Using a torch (like the kind for creme brulee) or broiler, char the garlic, ginger and green chilis until blackened. Throw the charred ginger, garlic, green chilis, cilantro, dal, turmeric and water in a pressure cooker. Heat over high until first whistle, then turn to medium heat and cook for another 7 minutes. Put pressure cooker until cold running water until the steam comes out, then open carefully. Take out the ginger, garlic, green chilis, and cilantro, then blend with an immersion blender. Season with salt. In a tadka or other small pan, heat the butter or ghee and add the mustard seeds, cumin seeds and fennel. Once the mustard seeds start to pop, add to the top of the dal. Enjoy!